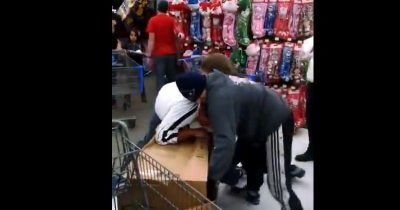 A video shows four men squabbling over a toy car during Black Friday shopping. It’s unclear exactly where the scene was captured, but it appears to be a Walmart. “You’re breaking it!” one woman tells the men. “Stop! Let go,” another can be heard saying. The younger man wearing a letterman jacket with the words, “Turner 2017,” gives up before two other men squabble over the item.